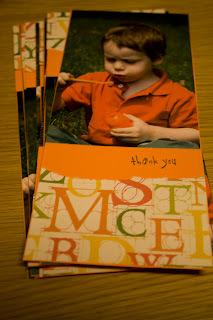 Though they haven't been mailed yet, wanted to share the thank you cards I made for Zane's b-day. I like to include a picture that truly captures the child and this photo of Zane captures him right now. He is so into bubbles this summer. The design is pretty simple and basic. And took hardly any time to actually make. So don't put off writing a thank you note, the recipient will love it. LOVE these!! Thanks for inspiring me to dig into my craft stash! !